Sofi Hindmarch has been interested in conservation since her childhood in rural Norway. As she she grew up, she saw new roads and logging change the landscape around her – processes called “development.” These changes upset her, and she has since made a career exposing habitat destruction and working to protect wildlife. 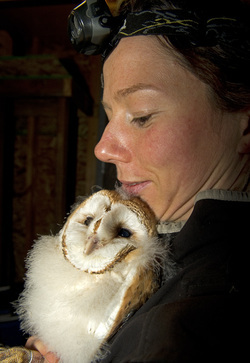 Sofi came to Simon Fraser University 10 years ago, studying how various human activities affect barn owls for her master’s degree. 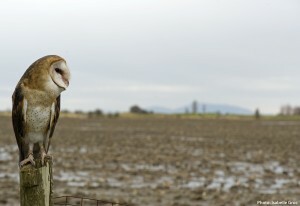 Now she is earning her PhD and doing more fieldwork with baby barn owls in southern British Columbia. As part of the crowdfunding campaign for our film, Sofi is generously inviting up to 6 people to spend a day in the field with herself and the owlets. You’ll even get a chance to help with her research! The field trip begins at dusk, when adult owls wake up and begin to hunt. You and Sofi will set up a ladder at the nest site – one of many old barns out in the farmland of Surrey, BC. You’ll bring chicks down from the barn one by one, holding them in your hands while Sofi affixes bands to their legs. Nests usually hold two to five owlets, and you’ll get to visit one or more nests during the evening. Watch our short film Silent Flight to see Sofi in action. SILENT FLIGHT from Isabelle Groc on Vimeo. When Sofi goes out to conduct her field work, it’s always an outstanding experience. The owlets have personalities that you’ll get to interact with. Some of them are calm and curious, some are feisty. Often, the parents will fly overhead, watching from a distance. Can you imagine the feeling of having such close interactions with wild birds? It’s going to be a once-in-a-lifetime trip for the lucky group that claims this perk on the Toad People Indiegogo page. Plus, it’s a double whammy for protecting species at risk. Your contribution greatly helps the Toad People team in our work to secure an endangered species law in BC – AND your participation in Sofi’s fieldwork supports her research on barn owls, which are a threatened species. BC must limit habitat destruction and it must be in writing, Sofi says. Development often happens so fast that species and habitat are lost before our eyes. We need checks and balances in the province of BC, especially while the province is pushing for massive new industrial projects. Given the current development pressures here, it’s imperative that we enact a strong provincial endangered species law. Visit Indiegogo to claim this fabulous perk! The Wilderness Committee is a grassroots environmental charity that works to preserve wilderness and wildlife across Canada. We have helped gain protection for millions of hectares of wilderness and critical wildlife habitat, and have celebrated precedent-setting legal victories on behalf of species at risk including the greater sage-grouse and killer whale. Become a Toad Person! Support the project by donating to the Wilderness Committee's campaign to protect species at risk in British Columbia. Thank you to all the Toad People on Indiegogo!